WASHINGTON, DC, December 14, 2011 (ENS) – The U.S. Environmental Protection Agency today issued a rule making greener refrigeration gases legal in household refrigerators and some commercial freezers. The agency added three hydrocarbons as acceptable alternatives in household and small commercial refrigerators and freezers through EPA’s Significant New Alternatives Policy program, SNAP, which evaluates substitute chemicals and technologies for ozone-depleting substances under the Clean Air Act. These newly-approved refrigerants can be used to replace ozone-depleting chlorofluorocarbon (CFC)-12 and hydrochlorofluorocarbon (HCFC)-22 in household refrigerators, freezers, combination refrigerator-freezers, and commercial stand-alone units. Refrigerators and freezers in the U.S. also chill with hydrofluorocarbons, HFCs, which do not destroy the ozone layer as do older refrigerants; but they are thousands of times more potent as greenhouse gases than carbon dioxide, pound for pound. The EPA took action after requests from Ben and Jerry’s, General Electric, and the multi-national refrigeration company True Manufacturing, as well as A.S. Trust & Holdings, a family-owned small business based in Hawaii, which holds a patent on R441A. Twenty years ago, Greenpeace pioneered this technology by developing the “GreenFreeze” hydrocarbon-cooled refrigerator. At that time the chemical industry was promoting HFCs as the “environmental alternative” to CFCs, which were phased out by the Montreal Protocol. Since 1993, over 600 million Greenfreeze type refrigerators have been sold worldwide by leading major appliance manufacturers, except in the United States and Canadian markets where they were not legal until the EPA’s new rule takes effect. 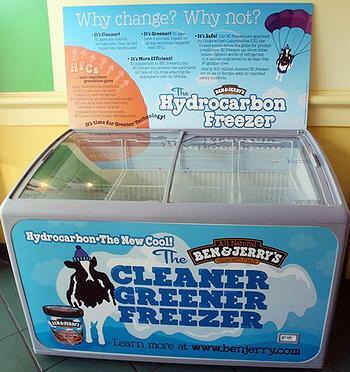 “After many years of hard work, we congratulate Ben & Jerry’s, AS Trust and Holdings and General Electric for this tremendous accomplishment, and we know other companies are waiting in the wings to use these alternatives” said Kert Davies, Greenpeace USA research director. Last year, at Larkin’s urging, the Consumer Goods Forum, a consortium of 400 consumer brands and retailers, resolved to eliminate HFCs from their refrigeration and cooling systems starting in 2015. In May 2011, these efforts were recognized with the Roy Award from Harvard’s Kennedy School of Government for Refrigerants, Naturally!, a public/private partnership founded by Coca-Cola, McDonald’s, and Unilever in 2004 that includes Greenpeace, the UN Environment Programme and other large companies. At least 40 percent of global household refrigerator production now utilizes hydrocarbons instead of HFCs. Companies that manufacture hydrocarbon-cooled refrigerators worldwide include: Bosch, Haier, Panasonic, LG, Miele, Electrolux, Whirlpool, and Siemens.